If there’s one thing that frustrates everybody trying to become a serious taster, it’s the difficulty of turning vivid sensory experiences into accurate and specific language. I’m asked about this all the time and reply, “Welcome to the club. You are not alone.” It’s best delivered with a hug. It seems so trivial. Even a toddler can effortlessly apply her limited vocabulary to tag anything that comes across her vision. Sounds, like a dog barking, can also trigger prompt verbalization of the source without the slightest hesitation. Why should the chemical senses—and aroma in particular—be so different, and so vexing? To answer this requires a digression into both evolution and neuroanatomy. At its heart, the purpose of our olfactory system is to safeguard our wellbeing. Over the eons, these systems have evolved to translate aromas into information about our environment, including potential sources of food, warning signs like decomposition, and deeply personal information like recognizing family or the suitability of a potential mate. Those sensory signals urge us to action, attracting, repelling or just tantalizing. Action requires motivation, often instantly. We’re no different in this than any of our millions of cousin creatures who have not yet developed a language in the same way we have. Motivation is best fueled by emotional states, so our olfactory system delivers what it needs for action: a feeling of whether this is good or bad, often based on memories of previous encounters. A monkey in the forest has no need for the name of the ripe, nourishing fruit he’s smelling. A happy memory is plenty of reason to get moving in that direction—right now. All of this takes place within the ancient inner workings of our minds, which are normally out of view and quite happy to operate without consciousness interfering. The amygdala and hippocampus in particular are responsible for this emotional processing; a few beats later the information starts to leapfrog up into the higher centers of cognition into our thinking brains, winding its way to our language centers. If we’re lucky and prepared for it, an actual word may pop into awareness. But it’s a long and winding road. Olfaction actually bypasses the thalamus, the central switchboard often thought of as the seat of consciousness on its way to our emotional core. We all have this handicap. You may not like it, but it does make sense. It’s not hopeless, though. We can learn vocabulary and even train ourselves to use these emotional memories to identify specific aromas and tag them with words. The first thing you must do is to learn to trust your inner taster and understand that it is never wrong. This requires a bit of a leap of faith, but you have to remember that you are not in charge of this aspect of your life, your lizard brain is. When you are in tasting mode, you have to suppress your urge to edit and make sense of what you are smelling, and just blurt out whatever idiotic thing springs to mind. I promise you this works. My wife Nancy has been along on my tasting adventure, but she’s never really pursued it as any kind of hobby. But after years of osmosis, she’s learned a lot of tricks, including this one. She particularly loves champagne and at a recent tasting, stuck her nose in the glass and came out with “Horseradish!,” which on the face of it of makes very little sense. But a second sniff revealed a certain earthy spiciness that fit the description perfectly, and I’m guessing a little detective work might have been able to pin it down to specific molecules. Honestly, this directness can offer rank amateurs some advantages over tasters with a certain level of training who have not yet had the insight of reckless honesty. One note, however: do this out of earshot of the winemaker. We all have had the experience of a particular aroma triggering a vivid memory where we are in a specific place. Those little flashbacks can be helpful if you can stay in them long enough to figure out just what that aroma is associated with. Is it banana candy in the candy shop? Most likely it’s isoamyl acetate, a banana-like aroma found most happily in hefeweizens and some Belgian styles. Now, to the words themselves. There are common terms used by industry professionals, but research shows words can interfere with our ability to recognize aromas and develop a working vocabulary. Here’s a little story a flavor chemist who once worked for Glade air fresheners told me. The big problem in the industry is that the flavors “wear out,” because users quickly habituate to the aromas and fail to maintain awareness of them. He said: “We created a cherry flavor that killed in the industry, and the competition couldn’t figure out why it worked so well, maintaining consumer awareness hour after hour. “The secret,” he revealed, “is that it wasn’t cherry. It was strawberry.” That meant that people’s smelling brains were looking for something, and failing to find exactly what they were seeking, maintained alertness for something that would never come. A similar problem can occur with many of the flavors we are trying to catalog. Acetaldehyde, for example, is a chemical associated with immature beer. The common industry descriptor is “green apple,” so naturally people go looking for Jolly Rancher. It took me years before I finally realized that to me it was more like the underside of a lawnmower that had run over some rotting apples. When somebody said “pumpkin guts,” that got me even closer. Latex paint, avocado or drunk breath (which it actually is) might do it for you. The point is, you have to take these one by on and internalize each for yourself. 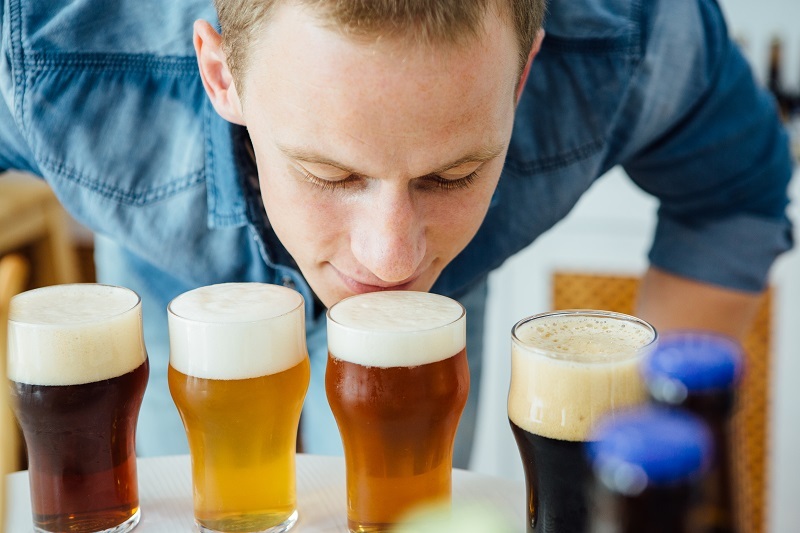 It’s a daunting task since there are hundreds, maybe thousands of aroma chemicals in beer, but nobody would ever expect you to know more than a few dozen. So where do you start? The good news is that we’ve spent all our lives as tasters, so we have a pretty good inventory of aromas, many of which we can actually name. Beer has three main sources of flavor: malt/grains, hops, and fermentation. Of course things like spices and aging in wood broaden the lexicon. 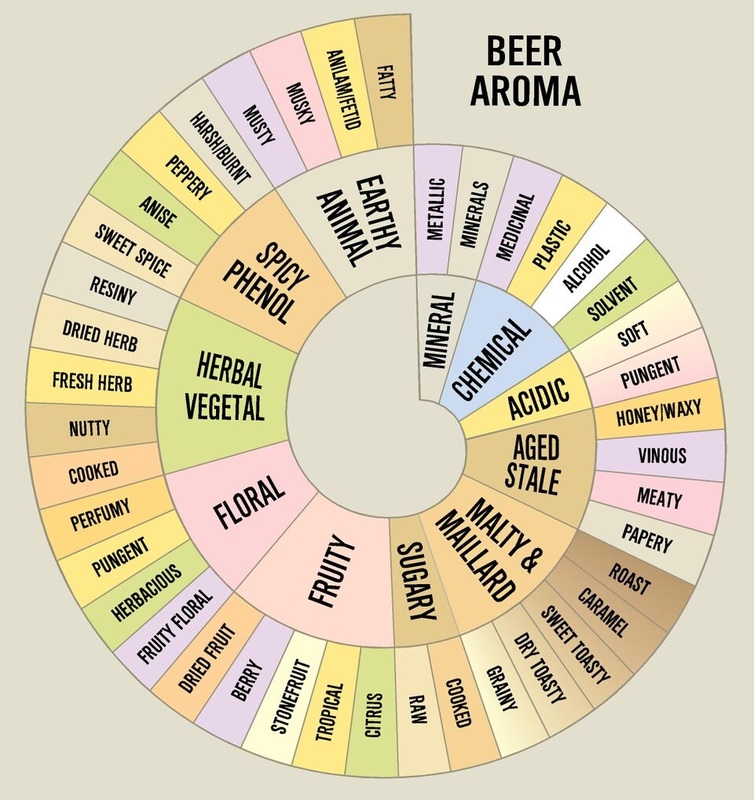 I’m including a graphic I put together showing a very basic comprehensive vocabulary of beer, with more general terms on the outside and more specific terms sub-dividing them. This is how to work as a taster: get the big categories first, then start drilling down to more and more specificity, sometimes ending up at an actual molecule. We’re fortunate with grain derived flavors because these are almost all created during the kilning and cooking stages of the process, so we borrow from our knowledge of cuisine: bread, crackers, cookies, nuts, caramel, toasty, roasty and so on. Super simple, right? Hops are more challenging. They contain hundreds of flavor-active compounds, and though many can be found in everything from herbs to citrus to pine to flowers, few of these chemicals actually taste exactly like anything we’re familiar with. So, we stick with general terms, trying to get as close as we can. Fermentation brings another overlay of flavor. With lagers, the whole idea is to minimize any flavor contribution from the yeast, so you can ignore this part and focus on ingredients. For all other beers, you need to look for fruity and possibly spicy aromas that are highly dependent on the yeast strain and fermentation temperature that cranks up yeast’s little chemical factory into high gear. Beer’s vocabulary is vast and can be a little intimidating. As it so often is with serious pursuits, the real game is mostly inside our own heads. So be patient, pay attention, pour that beer and get out of the way while your inner tasting beast does its job. Excellent article; thanks for educating and enlightening. Wonderful and brilliant article! Thank you!